I met with CEO Gina Bianchini a week ago to see the changes. Gina also gave me an update on how Ning is doing in general. Ning is a site that lets users create customized applications through Ning modules and third party web services. CCHits is an example – users contribute links to creative commons music. Other users vote on the music in a Digg-like fashion, and the best music makes it to the top of the site. Or see Trail Reviews, which combines trail discussions and voting with Google Maps. 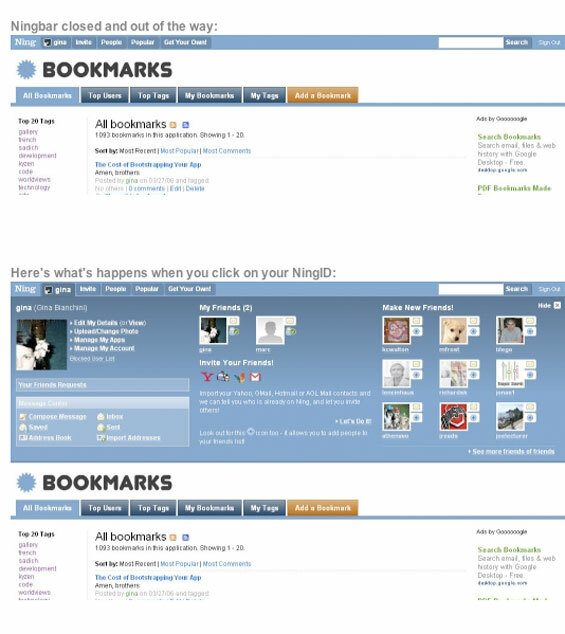 One of my favorite applications is Bookmarks, a surprisingly useful social bookmarking service (like del.icio.us). And for beer and sports fans, there’s Team Sports Bars. Applications on Ning can be cloned by other users who want to do things a little differently, by adding or removing modules or web services. Applications are hosted by Ning and share users (meaning once you’ve signed up for one Ning application, you are registered for all). Ning generates revenue from advertising placed on the applications and through premium options. For example, an application creator can pay $8/month to have advertising removed, or pay $5 per month to map an application to a custom domain. Other premium options are also available. Ning launched in October 2005. Since then, 14,000 applications have been created. Ning has registered users in 176 countries and 47% of users are non-U.S. So far, Ning users are there to participate as well as watch – on average, for every two new users to Ning a new application is built. Alexa page view stats show some positive trends, although Ning clearly hasn’t hit “hockey stick” growth stage yet. Ning still has a long way to go before users can add and remove modules and web services without any programming skills. Look for a release, scheduled for end-of-summer, to finally open up the core Ning features to all users.